Do you have the need for arcade racing speed? 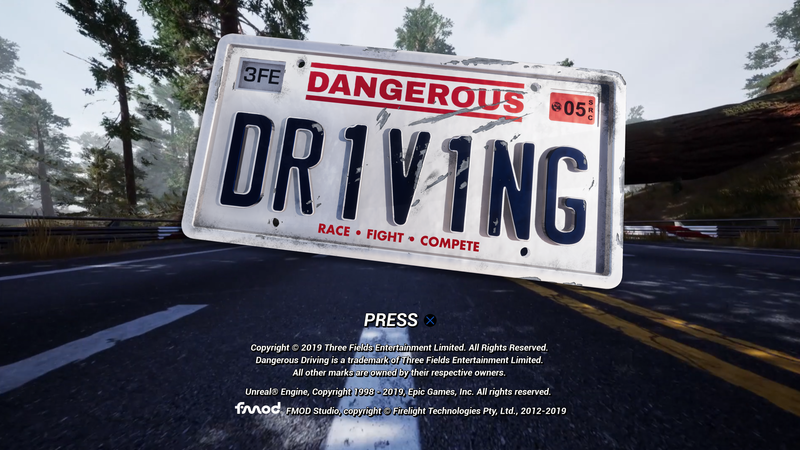 Three Fields Entertainment, a studio founded entirely by former Criterion Studios employees, hopes that their fourth release, Dangerous Driving, can help satiate your need to drive recklessly. Can the arcade racing genre be refreshed with this smaller-scale release? Dangerous Driving Review: How Many Dangerous Driving Modes Are There? At launch, Dangerous Driving’s main menu is bereft of the sorts of options you might expect to see in any given arcade racing game. People only have access to a tour, leaderboards, and settings. The tour mode follows a linear progression, whereby earning at least a bronze medal will unlock the next event. Occasionally, earning the gold medal in an event will unlock a new car. Players start at the Sedan level, which features average-looking vehicles that have decent top speed and handling, which are perfect to come to grips with Dangerous Racing’s handling systems. From there, players eventually unlock access to a Gran Prix, or GP, set of three races. Finishing in third place (earning a bronze medal) or better will unlock the next tier of races. Other vehicle classes include SUV, Coupe, Supercar, Hypercar, and finally, Formula DD. Don’t expect any name brands here—unlike Burnout, there aren’t even any made-up manufacturers. Most vehicle classes have a handful of variations, with emphasis on balance, boost, strength, or speed, and are unlocked by meeting certain conditions in particular races. The campaign features nine different race event types, from traditional races on a grid of six to eliminator-style races where last place is eliminated each lap. There is even a Road Rage event that feels ripped straight out of a Burnout game. This is a good thing, because the carnage that is produced is always fun. A unique event in each class is the Shakedown Preview. This allows players the chance to drive a vehicle in higher class, one that is usually not unlocked quite yet. This can provide good incentive for players to keep beating the 69 events in order to unlock them all. Split screen and online play are not options in Dangerous Driving. Three Fields Entertainment has stated that, while it has no plans to include split screen, the first DLC coming for the game will include online capabilities. Honestly though, the population of a game as small-scale as Dangerous Driving could probably see more benefit in supporting split screen play. Its arcade nature might cause some gamers to assume it has split screen support before they think of taking the race online. No doubt developing split screen support is difficult, but its inclusion could have helped to bring players coming back for more. Another peculiar omission in Dangerous Driving is the lack of a soundtrack. There is a single song that plays during the game’s menu screens, but there are no actual songs while racing in any event. Instead, Three Fields Entertainment opted for Spotify integration. The PS4 includes native Spotify playback, so this simply allows the game to control the audio while playing via the directional pad, which is quicker than pausing, holding the home button, and then controlling the music. Despite Three Fields Entertainment claiming that this feature requires Spotify Premium subscription to work, I got it to play just fine on a free account. But if this were the case, and not everyone could enjoy playing music while driving, then including even a basic and generic soundtrack would have been better than nothing. The Unreal Engine 4 has been the engine of choice for Three Fields Entertainment, as it was used for the developer’s previous games. Dangerous Driving utilizes this engine to pour visual effects on everything. Hitting anything causes all sorts of debris to be generated, while vehicles that sit lower to the ground often cause it to spit out sparks. Vehicles have a pretty simple damage model. Some classes, such as the SUV, have extra animations that may do things like have the rear door flopping around off the hinge once cars are damaged enough. Despite the arcade nature of Dangerous Driving, it does not appear to hit 60 frames per second on a PS4 Pro in 4K mode. There are also occasional stuttering problems with certain parts of some maps, which can actually cause players to run into traffic. Outside of that, gameplay is smooth overall. There is sadly also no photo mode, nor any replay options to speak of. So your epic moments can only be shared if captured via the PS4’s regular screenshot and video recording functionality. Dangerous Driving Review: How Many Dangerous Driving Courses Are There? Dangerous Driving features plenty of fun driving across its 31 courses, with all kinds of climates featured. That is, when the physics don’t get in the way. For the most part, speeding through any given level consists of deftly weaving left and right in between traffic and following the various curves in the course. 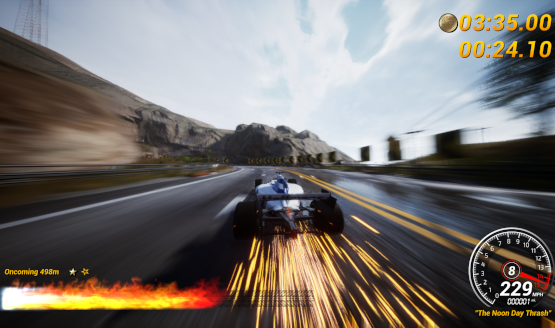 Most vehicles handle like a slightly heavier version of the cars in an average Burnout game, only without an e-brake option. As is the case in most arcade racers, some turns involve grinding against the railing of a turn. These turns are generally treated as smooth curves, but every so often they will cause cars to flip high into the air, usually triggering a crash. Races that feature a rolling start will occasionally cause NPC traffic to be hit by the player car, as it is computer-controlled for a little after the loading screen. In one instance, the race refused to start, as the player car was somehow knocked high into the air and kept bouncing around the level like a pinball. At one point, the car was completely mangled and began hopping around in a body of water in the level, like some sort of vehicular dolphin hybrid. It was hilarious, but not necessarily what you want to see in a racing game. Dangerous Driving can be fun in short spurts. The lack of car manufacturers’ licenses is expected when any game is priced at half the cost of bigger-scale games. But the lack of even a time attack mode means that once players have beaten the campaign, there is little reason to go back besides the inclusion of online leaderboards. Arcade racing games are also incredibly fun to play with others, and a lack of online and/or split screen support limits Dangerous Driving’s replayability. Sure, online is coming, eventually, but by the time that feature launches, how many buyers of this $29.99 arcade racing game will have moved on? Dangerous Driving review code provided by publisher. Version 1.02 reviewed on a PlayStation 4 Pro. For more information on scoring please see our Review Policy.